I read several food blogs daily, big surprise right? I consider the compelation to be my own personal newspaper, since I don’t read any mainstream newspaper. Some of you, I know read at least one newspaper a day…you have told me so, proudly, and I am proud of you. I actually admire you and want to be more like you. See I have tried to get into the habit of reading a daily newspaper. I have made it a New Year’s resolution, downloaded them to my Kindle, had them thrown at my front door. The only thing that has stuck is making CNN my homepage…so this is where I get my news – from headlines on www.cnn.com. Therefore, I may not know exactly what is going on in the Middle East or even in Cleveland, but I am always aware of what is hot at the farmer’s market, trending foods and cooking methods, and rarely do these blogs ever make worry about bombings, shootings, and coup d’etats. I don’t consider this a bubble, just a comfort zone. So what is hot at the farmer’s market? 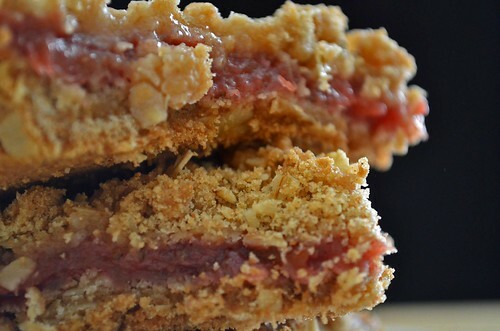 Strawberries and rhubarb!! Wahoo! I am pretty sure I am the only food blogger not to have blogged about this combination in the last month. So, I guess its my turn. I didn’t know exactly what to make. Sure there is pie – a favorite, or a crisp topped with some vanilla ice cream – currently salvating, or a muffin or quick bread topped with a pat of butter – oh yeah! However, these creations are how most people indulge in these fruit soul mates. Yes, they were made for eachother. I like knowing that God has a bit of a sweet tooth. I decided on bars. Its a mix between a crisp and a pie, well kinda, sorta, maybe. 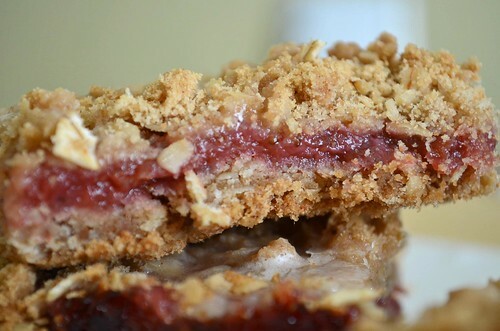 I took the crust from my Grandma’s famous raisen bars and filled the crust with a strawberry rhubarb jam-like substance. I was half tempted to save the filling and slather it on some toast, but I restrained. You can top the finished bars with a simple glaze, making this one heck of a summer dessert or breakfast – hey there is fruit and oatmeal…definately breakfast material. Definately. If you do not have whole wheat flour then by all means use 1 + 1/2 cups of all-purpose flour. I have a bag of whole wheat flour that I am experimenting with. Plus it was expensive and I don’t want to waste it. 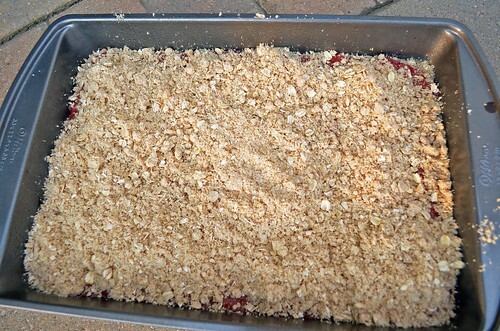 In a medium saucepan, add the lime juice, strawberry slices and rhubarb chunks. Cover and cook over medium heat, stirring occasionally until they are tender. This will take about 15 minutes. Stir together the corn starch and sugar. Add mixture to fruit. Continue to cook, stirring constantly until mixture comes to a boil. Boil until mixture thickens, about 1 minutes. Remove from heat and set aside while making crust. ( If you find that the mixture is too chunky for your liking, then take out your hand blender and give it a whirl.) The final product will look a lot like jam. Blend together the butter and brown sugar. 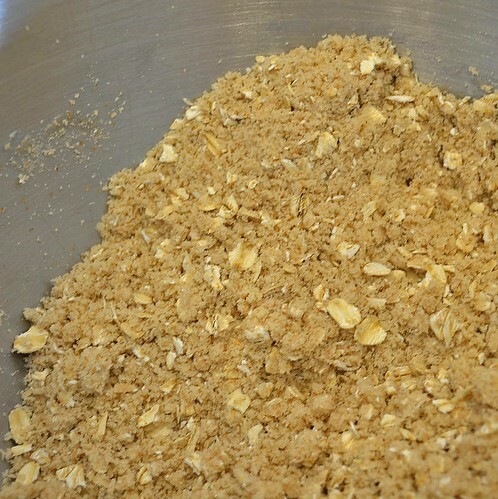 Sift together the dry ingredients (whole wheat flour, all purpose flour, salt, baking soda, and oats) and blend into the butter and sugar mixture. 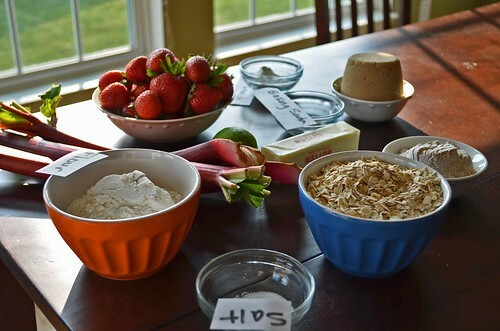 Blend until combined – the mixture will be very crumbly. In a greased 9 x 13 dish, press 1/2 to 2/3 of mixture (guess-timate) into bottom of pan, reserve the remaining. 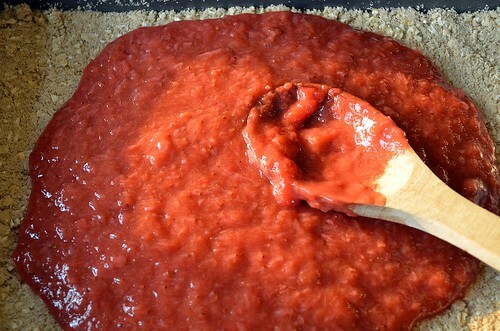 Pour strawberry and rhubarb filling over crust, spreading it evenly. Scatter remaining crust over filling – doesn’t have to be precise. Place in oven for 35 minutes, filling will be bubbly. Remove from oven and let cool, prepare the icing. Whisk together confectioner’s sugar, cinnamon, and milk. Add extra milk if necessary so its pourable. * I just finished my second serving…these are most definately worth the calories! While I was munching away, I was thinking of all the different fillings that could be substituted. I am totally going to try peach, cherry, and blueberry. Wowza, can’t wait!